A new service called HalleyBTC was just recently launched that offers high ROI for its Bitcoin savings investment options. The service is apparently operated and backed by one of the large Chinese Bitcoin mining farm operators – Halley China (though it seems that it could be ZeusMiner/ZeusHash instead through some partnership with Halley China), so that is apparently where the interest for your investment is coming from. While Halley China is not open to international investors (their website is only available in Chinese), it seems that the new HalleyBTC service is targeting a broader English speaking audience. They have definitely launched the new service right on time as with the recent jump in the price of Bitcoin there is a lot of increase in user’s interest in different ways to invest in Bitcoin. The service offers three types of investment options, the first one is called Current Deposit and it gives you 0.02% daily interest with no fixed period. The other two higher return options are for 30-Day Fixed Deposit with 15% expected APY (Annual Percentage Yield) and 90-Day Fixed Deposit with 17% expected APY. The higher interest rate is ensured by the fact that your investment is being locked for a specific term, so apparently the Bitcoin you invest on the long term can in turn be used for investment in the existing Bitcoin mining farms of the company to increase the mined coins for example. For their launch HalleyBTC is running a special promotion giving each new user the chance to get 1 to 10 Bitcoins as a bonus deposit to start your investment. All you have to do is register a new account and click on the Get Bonus button on the main page. Do note that what you get as a bonus investment in BTC cannot be withdrawn and will be in your account for 10 days only, what you get to keep is the interest rate you accumulate on the amount for these 10 days. The idea is to get to try and see how the service works without having to invest any of your own Bitcoins up front, do note however that this promotion is only valid up to November 8th November 15th, so do take advantage of the offer before actually sending any of your own coins! 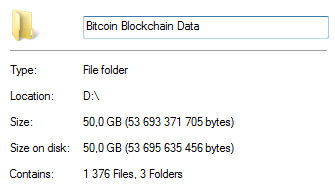 Earlier this year we have reported when the Bitcoin Blockchain data files have passed the 40GB mark and now, just about three and a half months later, the data files have reached a total size of 50GB. This all comes as a result of the increased number of transactions and the wider usage and adoption of Bitcoin, but as the size of the Blockchain data continues to grow it also becomes harder for users to run a full local wallet. An alternative is to go for a lighter version of a Bitcoin wallet that does not need all of the Blockchain data stored locally. You can also go for a service offering online Bitcoin wallets a more attractive choice as they will save you the trouble of taking up quite a lot of space on your hard drive and the slow update times if you do not run the wallet often enough to keep it synchronized. Not to mention that if you are using the default data directory on your C drive you might be having trouble finding enough free space, especially if you use a smaller SSD for a system drive. 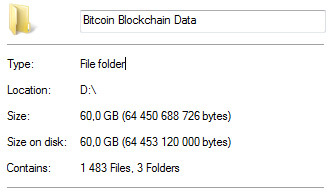 The solution for this would be to move the Blockchain data files to another drive and run the Bitcoin Core client with the datadir parameter pointing it to the drive and folder you have moved the data files in like for example a second hard drive.